Plusieurs œuvres qui ont été enregistrées lors de l’exposition « Mosaic / Mosaïque » à la galerie Trinity cette année n’ont pas pu être présentées vu la quantité et la qualité exceptionnelle du travail des membres d’Arteast. Ces œuvres ont été retenues pour être présentées lors de cette nouvelle exposition « More Mosaic /Mosaïque plus » à la Promenade Arteast du Centre des Arts Shenkman. 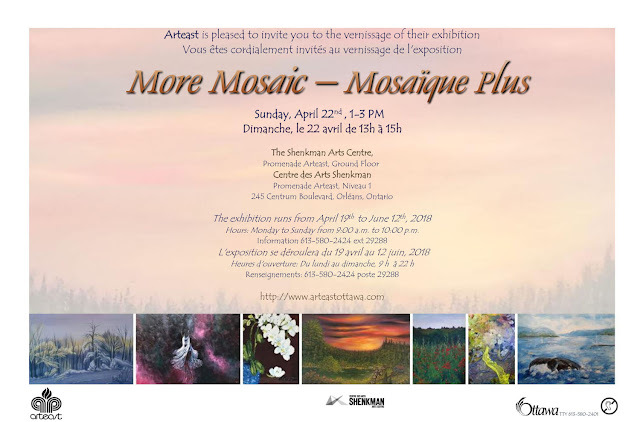 Le public est invité au Vernissage de l’exposition « More Mosaic / Mosaïque Plus » présenté par les membres d’Arteast. La réception aura lieu le dimanche 22 avril 2018, de 13h à 15h au niveau 1 du Centre des Arts Shenkman, 245 Boulevard Centrum, à Orléans. The public is invited to an opening reception for More Mosaic/Mosaïque Plus - the latest show to be presented by Arteast. The reception will take place on Sunday, April 22, from 1:00 p.m. to 3:00 p.m. on the ground floor of the Shenkman Arts Centre, 245 Centrum Boulevard, Orleans. This exhibition is an extension of Arteast's annual juried show Mosaic/ Mosaïque which was presented earlier in the Trinity Gallery and showcases the exceptional quality of artworks produced by its members. The Administrative Assistant will undertake a wide variety of activities in supporting the Board of Directors and the Planning and Management Committee. Undertake basic bookkeeping tasks, including maintaining related files and records. Assist in the preparation of regularly-scheduled accounting reports. Update and maintain membership records and file. Prepare and mail welcome packages to new members. Notify members re renewals of membership. Receive, prepare and dispatch Arteast's weekly Digest of announcements (via Blogspot). Update and maintain all social media accounts, approved by the Board. Ensure Arteast is marketed on relevant current social media sites. Assist Facebook and Show coordinators with all Arteast calls for artists, exhibitions, etc. Ensure that the Arteast website is up-to-date, by liaising with the web administrator to add and remove information. Receive and forward to the web administrator changeover notices, Grow with Art meetings and other notices about Arteast activities and programs. Actively research grants for Arteast. Assist the lead coordinators of the annual juried shows. i.e. Mosaic (Trinity Gallery at the Shenkman Arts Centre) and the Arteast Juried Awards Exhibition (St. Laurent Recreation Complex), by providing data entry services and compilation of lists for the registration of exhibition applicants. Attend meetings of the Board and the Management and Planning Committee. Responsible for general administrative duties as required. Other duties as assigned by the Board of Directors from time to time. Knowledge of Arteast and the general Arts community. Computer and social media skills. Excellent written and oral communication skills, with an exceptional attention-to-detail facility. Superior organizational, inter-personal, multi-tasking and time management skills. Strong work ethic and the ability to work independently. Team player who is proactive, flexible and can prioritize. Experience of Microsoft Office, especially Excel. Open during business hours, 5 days a week. Thank you to The Review, Vankleek Hill 's newspaper! Now celebrating their 125th anniversary. I am looking for two visual artists to give a short presentation at the upcoming Arts Night presentation to be held on Friday May 25, and June 29 2018. 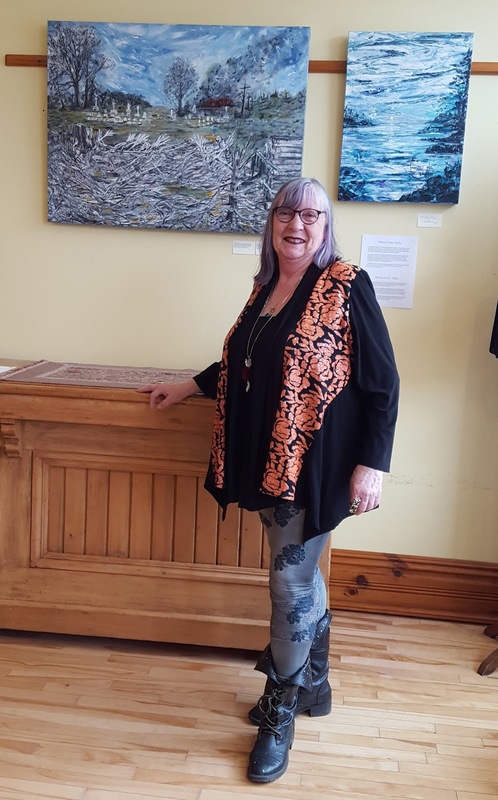 Arts Night is held on the last Friday of each month from September to June at The First Unitarian Congregation of Ottawa, located at 30 Cleary Ave. in the west end of Ottawa, off Richmond Rd. and one stop-light block east of Woodroffe Ave. These events start at 7:30 pm and begin with an "open set", a time when members of the audience may give up to a five-minute presentation of any art form. We then present three guest artists, one each in the literary, visual, and musical arts, who share their particular art form, converse, and answer questions from the audience. The following are guidelines for the presenting artists, but you are free to present as you wish. Questions to ponder for Performance Artists of Arts Night presentations. Thank you for agreeing to take part in Arts Night. As you may be aware, you have twenty, possibly thirty minutes only for the musician, in which to share the passion of your art with the audience. We would rather have more passion than perfection of performance. Arts Night is held in a very informal, friendly, and non-threatening atmosphere. You will never be ‘graded’ with other artists, all we wish is that you share the sincerity with which you perform your particular form of art. 1. Why am I doing what I do? 2. Is it because I am able to, or because I am compelled to? 3. When did I start and what made me start? 4. What has made me continue with my art, and has brought me to this state where I am at the present time? 5. What do I derive from my art? 6. If I weren’t skilled or successful with my particular form of artistry, would I continue to do it anyway? These questions are guidelines only, and the answers to them or any other questions, are some of what we would like you to share with the audience. We also hope that you will see fit to demonstrate some of your artistry or do a short presentation for the audience. Bring books or paintings for demonstration or sale if you like. There are two other guest artists who will be presenting with you on that evening, and at the end of all three performances, after refreshments, you all will be asked to return to the mike, where members of the audience will be able to direct questions to you and your fellow artists. The speaking order so far has been, the writer first, followed by the visual artist, and finally the musical artist. This has worked well in the past, so for the present, we plan to continue in this sequence. The date of your performance could be Friday, May 25 or June 29, 2018. Please let us know what props you will need us to provide for your presentation, and try to be there on time so that we can arrange any particular set-up you may need. We will have a microphone available for your use. Some artists come prepared with a pre-written address, so that all they wish to say may be included within the given time. Would you kindly forward a short bio as soon as possible, which will help the host for the event to introduce you to the audience. All the revenue from this event is donated to the First Unitarian Congregation of Ottawa, as they allow us to use the facilities at no cost. Please invite your family and friends, as we would like to have a full house. The average attendance so far has been around thirty people, an audience which we would like to boost the numbers in the near future. Refreshments will be provided. The cost is $5.00 or pay-what-you can per person, but of course, as an invited guest, you are exempted from paying. We are sure you will enjoy the evening. Visit us also for Arts Night presentations on the last Friday of each month (September until June, except December). Thanks again for taking part and helping to make the evening a real success. Artists’ Legal Services Ottawa (ALSO) is thrilled to announce a full-day arts law conference in celebration of its 5th anniversary. The conference will be geared to different genres of arts (i.e. fine arts, music and media arts), and will include sessions on artist-specific issues relating to succession planning, taxes, and employment law. There will also be mentoring sessions for attendees and a networking reception to build bridges within our artistic community, as well as with lawyers. The conference will take place on Saturday, May 5, 2018 from 10:00am to 4:30pm at the recently renovated Arts Court at 2 Daly Avenue in Ottawa. The networking reception will follow from 4:30pm-6:00pm. Panelists will include local artists such as JUNO Award winner Kellylee Evans and filmmaker Maxwell McGuire, as well as Ottawa professionals and lawyers including Mark Edwards of Edwards PC, Creative Law. Penny McCann, media artist and outgoing Director of SAW Video, will provide a keynote address. The event is sponsored in part by the City of Ottawa. Registration is now open and tickets are $25 at artscourt.ca/events/also-arts-law-conference/. Lunch is included in the ticket price. Register now, as spaces are limited. ALSO is a not-for-profit organization established in 2012 and is dedicated to sharing legal information with artists in the National Capital Region to fill an access to justice need, often overlooked for artists. The group is run completely by volunteer lawyers and artists. For the past 5 years, ALSO has hosted numerous educational panels annually on themes relating to artists’ legal rights and issues. Les Services juridiques pour artistes d'Ottawa (SJAO - Artists’ Legal Services Ottawa (ALSO) en anglais) sont ravis d'annoncer une conférence d'une journée sur le droit des arts à l'occasion de son 5e anniversaire. La conférence sera axée sur différents genres d'arts (p.ex. les beaux-arts, la musique et les arts médiatiques) et comprendra des séances sur des questions propres aux artistes en matière de planification de succession, de fiscalité et de droit du travail. Il y aura aussi des séances de mentorat pour les participants et une réception de réseautage pour tisser des liens au sein de la communauté artistique, ainsi qu'avec les avocats. La conférence aura lieu le samedi 5 mai 2018 de 10 h à 16 h 30 à la Cour des arts, récemment rénovée, située au 2, avenue Daly, à Ottawa. La réception de réseautage suivra de 16 h 30 à 18 h.
Les panélistes incluront des artistes locaux tels que Kellylee Evans, lauréate d'un prix JUNO, et Maxwell McGuire, un cinéaste, ainsi que des professionnels et des avocats d'Ottawa, dont Mark Edwards d’Edwards PC, Creative Law. Penny McCann, artiste médiatique et directrice sortante de SAW Video, prononcera un discours d'ouverture. L'événement est parrainé en partie par la Ville d'Ottawa. Les inscriptions sont maintenant ouvertes. Les billets sont de 25 $ et sont disponibles via courdesarts.ca/events/also-conference-sur-le-droit-des-arts/. Le dîner est inclus dans le prix du billet. Inscrivez-vous maintenant, car les places sont limitées. Les SAJO est un organisme sans but lucratif créé en 2012 qui se consacre au partage de l'information juridique avec les artistes de la région de la capitale nationale afin de combler un besoin d'accès à la justice, souvent négligé pour les artistes. Le groupe est entièrement dirigé par des avocats et des artistes bénévoles. Au cours des cinq dernières années, les SAJO organise de nombreuses conférences éducatives sur des thèmes liés aux droits et aux questions juridiques des artistes.